If you have an SD card mounted on your device, then you can easily read & write files to the SD card from Office on Android apps. On the Open page, tap This device. Tap SD Card or Documents (SD Card). 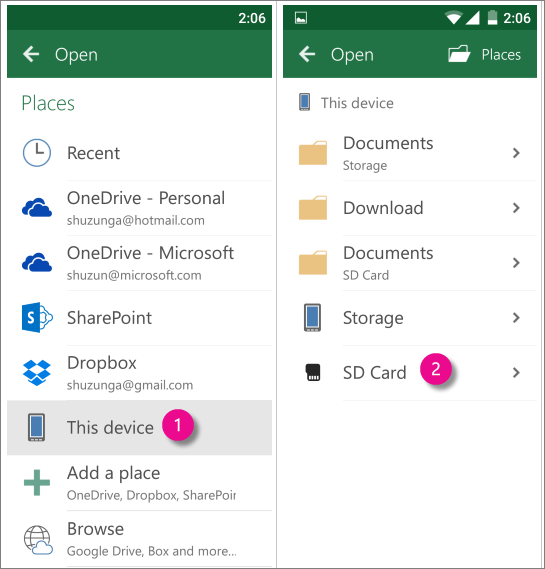 To save a file to SD card on your device, tap Save or Save as and select Documents (SD Card). Due to some limitations with Android, your app can only save to the folder Documents (SD Card), which is stored in SD card>Android>Data in SD card . You can use the shortcut from the Save page in Office for Android apps to save to this folder.